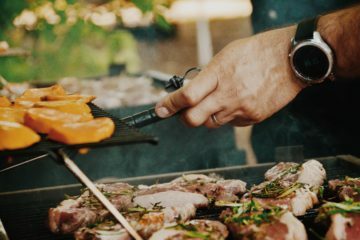 With summer here, you’re going to be spending more time out on the water, and you’ll need one of the best boat grills if you want to cook your catch and entertain on your boat. A boat grill needs to be portable and also safe to use, so it’s not quite as simple as picking up any portable grill. 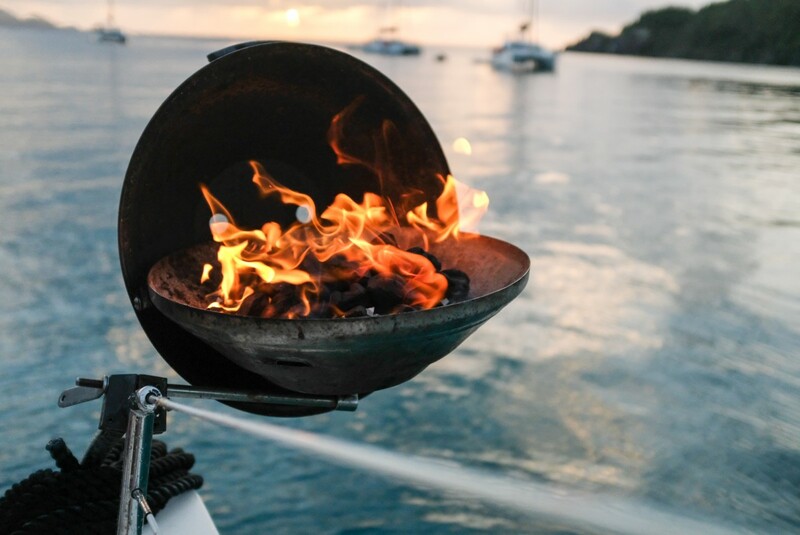 To help you choose, we’ve compiled a list of the best boat grills that provide excellent cooking capabilities as well as portable features and safety-friendly designs. We’ve also included some essential accessories that can allow for easy and convenient mounting. Should You Choose Charcoal or Gas When Grilling on a Boat ? Being out on the water, the conditions will never be as stable as when you are cooking on land. This is something that you can’t get around and it’s a challenge for any boat owner. You shouldn’t have to compromise when you are cooking along the coast or even on a lake, which means that you’ll need to buy a grill that is specifically designed for boating. The differences between a standard grill and a boat grill are not overwhelming, but they are still important. Boat grills are often stand or rail mounted, and they will have designs which aim to keep the cooking fuel inside of the grill, no matter the conditions. 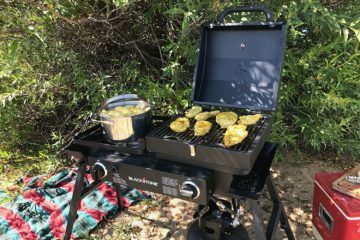 This means that, yes, you can use a charcoal grill when you are out on the water, just as long as it is one that has been designed for marine use. Magma Products Marine Kettle, Charcoal Grill w/ Hinged Lid. Take the Magma Products Marine Kettle Charcoal Grill as an example. While most boat owners do choose gas grills for safety and convenience, there are some who demand a charcoal cooking experience. Charcoal is well known for providing a unique flavor and this is something that many grill enthusiasts don’t want to go without. If you are in this camp, then the Magma Products Marine Kettle is for you. The grill is made from an attractive 18-9 mirror stainless steel that will perfectly complement your small boat or yacht. 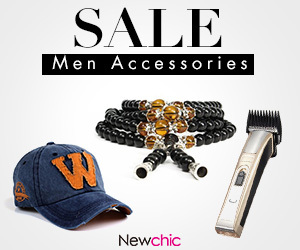 The grill is available in two sizes with a 13 inch and 15 inch model. 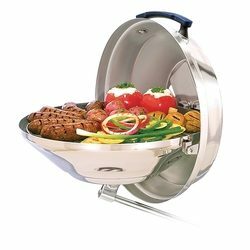 The design is similar to other kettle grills with a rounded cooking surface and a deep bowl for storing the cooking fuel. This grill can be mounted on standard grill mounting hardware which you can purchase from Magma Products, or you could use a mounting arm if you already have one for your boat. Magma Products is well known for high quality best boat grills and marine cooking gear, and this model is highly reviewed by verified owners. 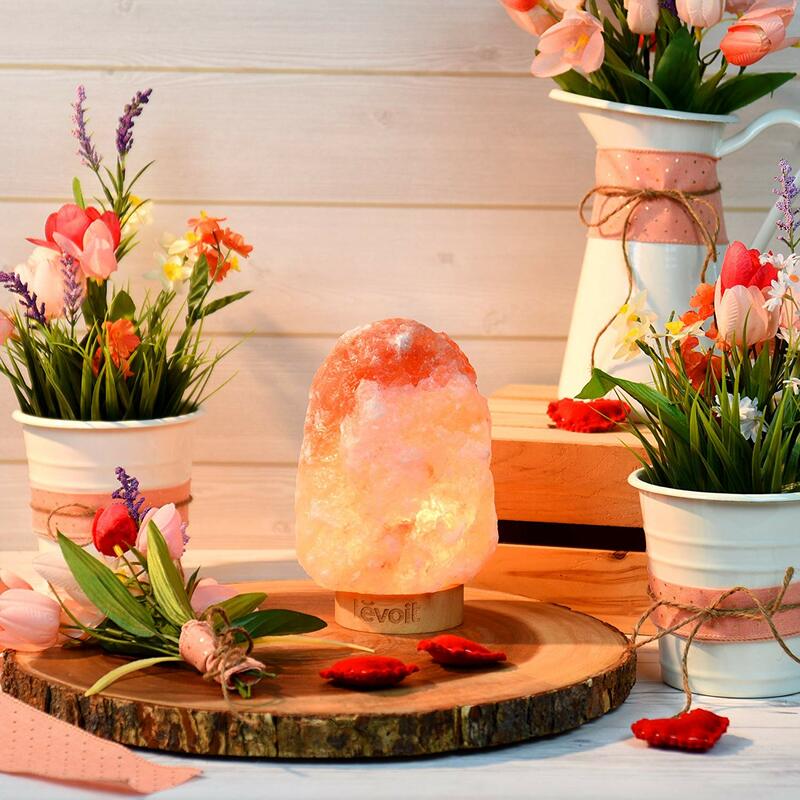 Online reviews average 4.2 out of 5 Stars, with owners loving the quality and the ease of use. If you are interested in this grill but don’t have the right mounting hardware on your boat, then the Magma Proucts T10-355 Fishing Rod Holder Grill Mount would be a great investment. It’s made from high quality stainless steel and is socket mounted so will be suitable for all modern boats and yachts. You could also go for quick release mounting hardware, such as the Magma Products Round Rail Grill Mounting Hardware. If charcoal isn’t your thing, or if you simply want the convenience of gas, then there are options available for you. Cooking with gas comes with a number of advantages. You won’t need to carry solid fuel on board, there is no chance of fuel spillage, and cleanup will be much easier. Extreme Marine Products Cuisinart Grill Modified for Pontoon Boat with Arnall’s Grill Bracket Set SILVER. The Cuisinart CGC-180 is one of the most popular portable gas grills used on land. With this set, you get a modified grill that makes it one of the best boat grills. The modified Cuisinart boat grill has 145 square inches of grilling area and can cook for 4 to 6 people, depending on the food that you are grilling. Whether you are cooking fresh catch or anything that you have brought on board, you will find that this grill can provide comparative cooking to your grill at home. The grill was originally designed as a freestanding or tabletop grill, which means it is easily converted to marine use. This particular package can be mounted to 1.25” pontoon railings, which makes it perfect for use on a pontoon boat. Any vessel that has similar sized square railing would also be suitable for this grill. The grill brackets are made by Arnall’s and use high quality metals that are stress tested and formed for a perfect fit. When you cook on a grill of this size you can expect to prepare anything from steak, to fish, and even hot dogs and burgers. There is a hood on the grill although the depth is small, so you won’t be cooking anything large like a whole chicken or large cuts of beef and pork. However, you can cook smaller pieces of bone-in chicken without trouble. It’s not the largest grill on the market and it’s not intended to be. 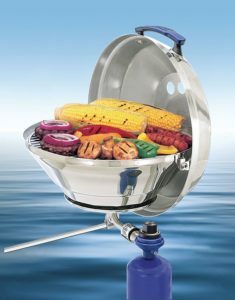 This is something that you can use when you want the most compact grilling experience on your boat. There are competing models with larger hoods if you want something that is more versatile, but you will often pay for the privilege. Overall this is one of the best combinations of size, portability, and cooking capabilities at this price point. The fact that the grill comes with custom mounting hardware will mean that you won’t need to buy any extra accessories, and you won’t need to spend time researching something that will fit. If you want convenience and something that gets the job done right, then this will be something that should go on your shortlist. 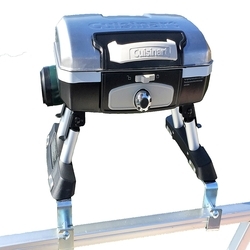 Because this grill was originally designed for use on land, it can easily be modified to use standard Cuisinart telescoping stands, or it can also be used as a tabletop gas grill. This could make it quite a versatile investment if you only cook on your boat a few times each season, and want something that can also be used for camping or backyard cooking for family meals. Although this requires a little more effort and tools, it’s a good solution if you don’t mind the DIY aspect.. The Cuisinart grill has been modified with an Arnall’s Pontoon Grill Bracket set. While it’s an all-in-one product, there may be cases where you want to use your own grill. Maybe you already have a suitable boat grill, or you simple want another option that is not a Cuisinart. If you have the time to modify your freestanding or tabletop grill, then you could use the Arnall’s Pontoon Grill Bracket Set and do the work yourself. Although this requires a little more effort and tools, it’s a good solution if you don’t mind the DIY aspect. The bracket set is made for 1.25” square pontoon railings and requires that you drill into the bottom of your own grill for mounting. It could be a great way to repurpose a picnic tabletop grill that you have at home. Customer reviews for the mounting hardware have been positive, with an average of 4.3 out of 5 Stars from online reviews. There are numerous examples of customers using the mounting kit for different grills, including Cuisinart models, Weber Q grills, and older box style tabletop grills. If your grill has holes pre-drilled in the bottom for a stand, then you may be able to bolt your grill onto the brackets without any major modification. The required work will ultimately depend on the grill you have, and what kind of mounting solution it uses. Again, this type of bracket set requires some DIY work, so this is only for those that don’t mind getting more involved to have a working marine grill. If you want something that works with universal mounts, then simply read on to our other suggestions for the best boat grills available in 2019. The Kuuma Stow and Go 160 Propane Grill is made entirely from stainless steel. 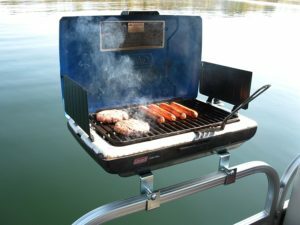 This grill is a versatile option that can be easily mounted on a compatible stand, or used as a tabletop grill when you’re not on the water. The first thing that you will notice about this grill is its sleek and impressive design. The Kuuma Stow and Go 160 Propane Grill is made entirely from stainless steel. This means that everything from the firebox, to the hood, and even the grid surface is corrosion resistant and perfect for use in a marine environment. The squared design is understated but also quite elegant, making it perfect for your boat or yacht. The grill can be used in various conditions, even with a fair amount of wind. There’s an adjustable air baffle for owners that have problems with the flame going out. It works with Coleman replaceable gas bottles and can also be used with larger refillable tanks. The use of gas makes it convenient and the built-in regulator will ensure that you can keep temperatures at your required levels. ‘Much like the Cuisinart grill, the hood is relatively shallow, but it still provides enough room for basic cooking when out on your boat. You’ll be able to cook most of your favorite foods, excluding the largest cuts of meat. 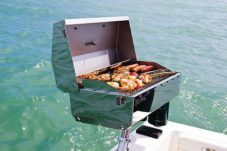 The included fold out stands mean that you can take this off your boat and use it anywhere that you need a portable grill. The only downside with this model is that you will need an additional mounting arm if you don’t already have one. This can add to the price. The good news is that the mounting arm doesn’t require that any modifications be made. The Kuuma 60 Rod Holder Grill Mount has been designed specifically for this model. 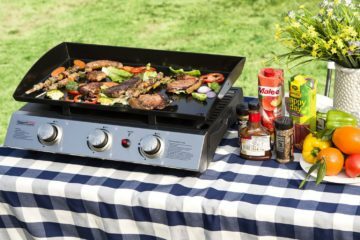 The grill can also be used open-top with the hinged hood acting as a wind guard or splash guard. We finish this overview of the best boat grills where we started, with a Magma Marine model. There are reasons that these grills are favored by boat owners, with the increased size and rounded grill surface being some of the most important. There’s something unique about the designs (at least in terms of boat grills) that make them highly popular with discerning buyers. This model mirrors the charcoal model in almost every way, with the difference being that it uses gas as a fuel source. There are minor changes to the design to accommodate gas cooking, all of which will be appreciated by boat owners. It uses a windproof control valve which eliminates blowouts and the need for relighting while cooking. Some boat grills are notorious for losing flame in even light wind conditions, so this will be appreciated if you’ve dealt with a substandard grill in the past. It uses the highly polished stainless steel that Magma Marine is known for, and it is attractive on both modern and classic boats. It has an incorporated hood which offers more depth than the average boat grill, which can allow for more versatile cooking options. The grill can also be used open-top with the hinged hood acting as a wind guard or splash guard. The Magma Marine Kettle Gas Grill also features a design that allows for both direct flame and convection cooking. Heat moves naturally around the kettle to ensure that food is cooked thoroughly when the hood is down. Magma Marine grills can cost more than the budget-focused portable boat grills, but they are made from high quality metals and feature the best designs. If price is not a problem and you simply want one of the most capable boat grills that you can get, then this is one of the models to consider. Buying a grill for a boat is unique when compared to tabletop and free standing grills. You will have different needs and considerations to make, so you should take your time before selecting the perfect model for your unique scenario. Take these suggestions and decide which one is most suited to you, and you’ll enjoy a quality grill that will last for many seasons on your boat.